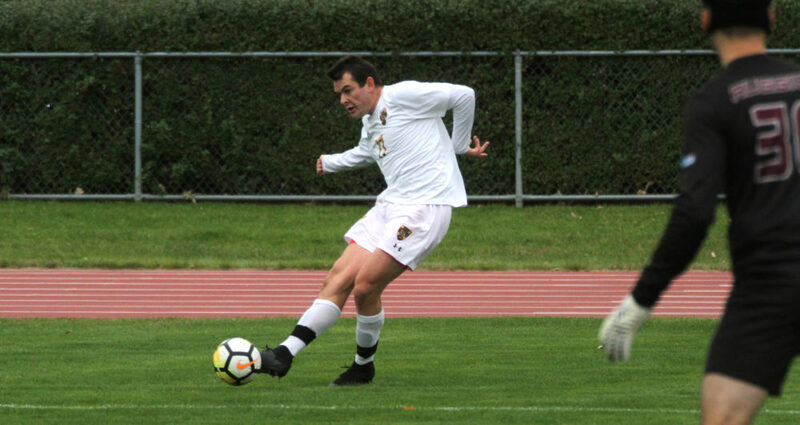 SAINT PETER, Minn. – For the second consecutive match, the Gustavus men’s soccer team Saturday ended a scoreless battle in the waning moments of regulation to claim a 1-0 conference victory. Matt Gibbons (So., Minneapolis, Minn.) weaved his way through Augsburg defenders in the box and rifled a shot into the right side of the net for what proved to be the game-winning goal in the 82nd minute. Scott Heinen (So., Aurora, Ill.) was credited with the assist, his team-leading fifth of the season. Gustavus’s shutout victory over Augsburg keep it on top of the MIAC standings at 4-0-1 in the league and 7-1-1 overall, while the Auggies drop their first conference match, moving to 6-2 overall and 3-1 in the MIAC. The Gustie defense was on point today, allowing just two shots throughout the entire match. The two Auggie chances were dangerous, though, as the first went off the post and the second was a diving save by Anders Severson (Sr., Woodbury, Minn.). Both shots by Augsburg were in the second half as the Gusties outshot the opposition 4-0 in the first and 6-2 in the second. Gustavus next hosts St. Scholastica in a non-conference match at 4 p.m. Tuesday.